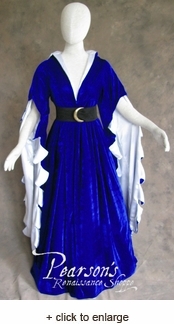 This long gown with an even longer back train is made out of poly-velvet; its full sleeve tippets and wide, tilted-out collar and bodice are all lined in colored satin. 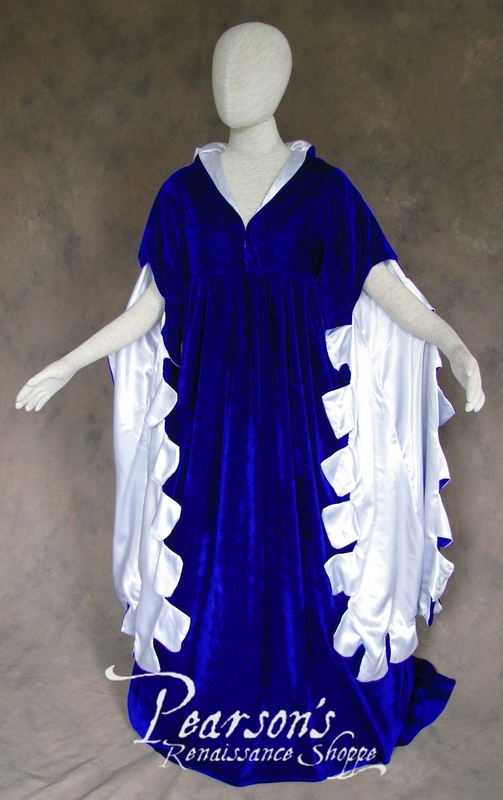 Known by historians as a scalloped Houppelande, it has extremely long arm tippets that are covered up and down the sides with lined scalloped. 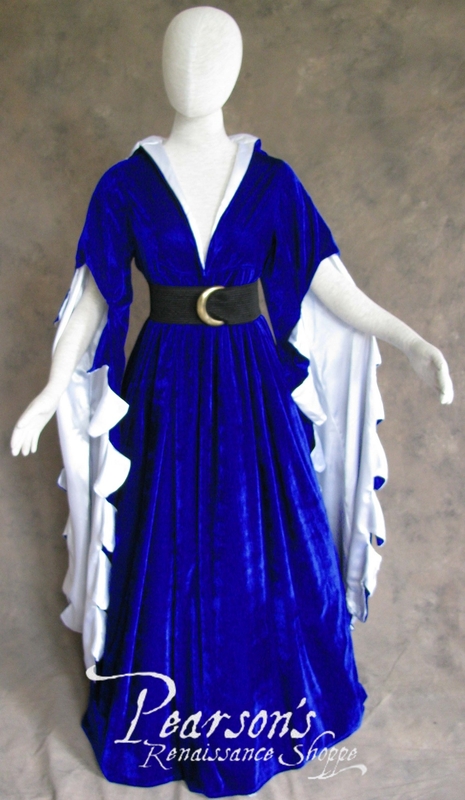 In keeping with the historical authenticity of the gown, it has a fairly high waistline and was often (but not necessarily) worn with a belt (belt in some of the photos is NOT included--for demonstration purposes only) and underdress or shirt. 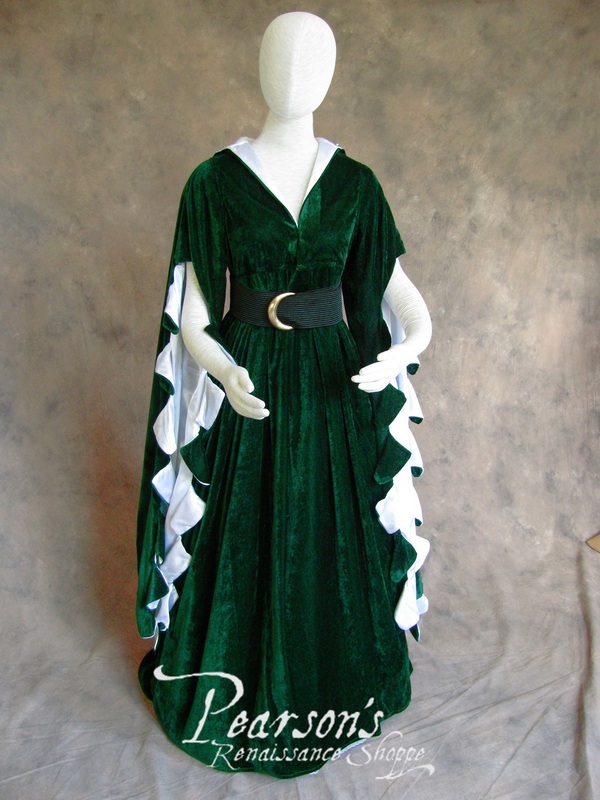 This is a garment for an upper-class lady only, not a peasant or your typical washer-woman in the castle. So wear it with pride. 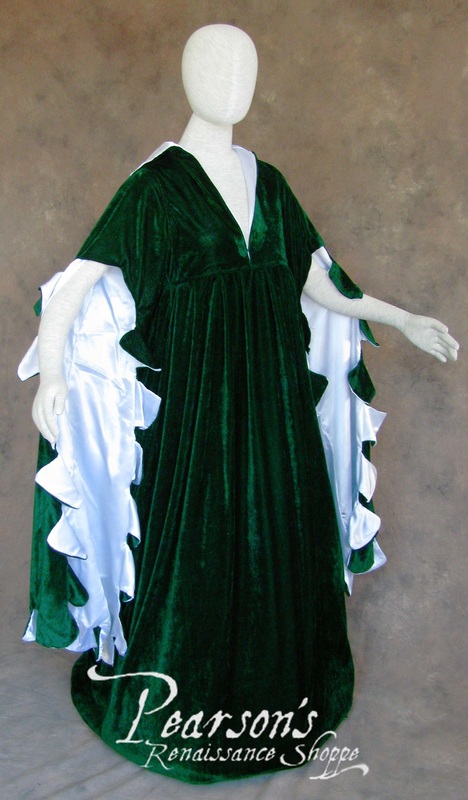 See below for more information on how this gown is meant to be worn and what made it so typically upper-class Renaissance in style. Especially popular from the 1400s to 1550s but also worn throughout the 1600s, the houppelande dress was a staple of upper-nobility court wear. You can see manuscript illustrations of ladies and gents wearing them as they stroll, chat, read their verses, and embroider their veils in such famous medieval books such as the The Tres Riches Heurs of the Duc du Berry and Christine de Pizan's Book of the City of Ladies (yes, women DID write non-religious literature even in the Middle Ages and Renaissance!) The British Museum, the Musee de Cluny, and countless museums and rare book collections are filled with paintings and tapestries showing ladies wearing these long, trained gowns with extra long arm tippets that usually had decoration along the sides like lined scallops (like ours does), dags, or fur trim. The houppelande was even in style for men, though they only wore them just past their knees with hose beneath. The houppelande was usually worn with an underdress which showed as a sleeve down to the wrist or even longer over the first thumb knuckle and sometimes showed at the neck between the very wide collar. Don't have the proper underdress for this outfit? You can get around this by just purchasing any basic tight long-sleeved tee! It will do the trick just fine!